Yes, I finally did it. I finally went to the one restaurant that has been on my hit list for the longest time. 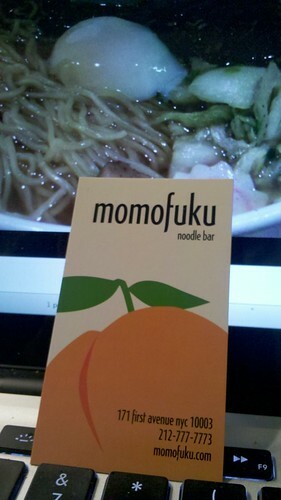 I finally made it to lunch at the Momofuku Noodle Bar. Apparently the place is still super popular judging by the typical Manhattan line up 15 minutes before the place opened. That, I did not expect at all. I had actually shown up 20 minutes before opening, saw maybe 5 people hanging out in various places on the sidewalk, then decided to cross the street for a few minutes to pop into a consignment store. I come out not even 5 minutes later, and there were 20 people crowded around the front. Crazy! The place is tiny, and we were seated at one of the bars behind the soda machine, but right across the way from the open kitchen. 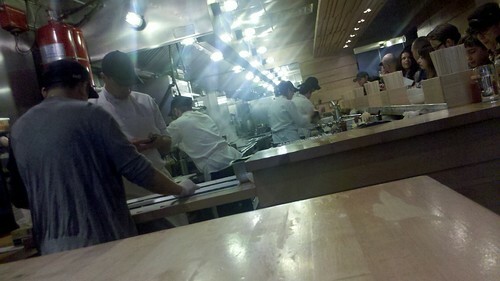 It was pretty awesome to see and hear the kitchen in action during the lunchtime rush. We knew what we were here for. One order of Pork Buns, the Pork Ramen special for Liz and the Momofuku Ramen for me. 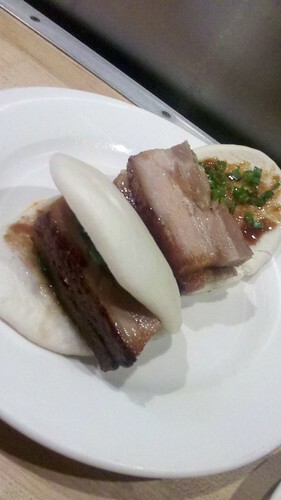 The pork buns arrived first. Thick slices of roasted pork glistening atop cucumber goodness. This was the moment of truth, was this going to be as epic as I always thought it might be? I took a bite, and I can say, yes. It was delicious, and if you were going to try pork belly just once, this was the way to try it. The subtle sweet crunchy top followed by layers of melt in your mouth flavor filled fat and oh so tender meat. Combined with the sauce and the cucumber and scallions, it was amazing. The ones I make pale in comparison. As we slowly savored each of the limited bites available, Liz made a good point. Pork is terribly underrated in this country. It is well prepared, good quality pork (in this case, good quality and local!) that keeps me from being a vegetarian full time. Next came the ramen. Ramen has this poor college student vibe in this country. Cheap, instant and can be cooked in a microwave. But ramen is so much more than that. In Japan, there is a whole culture that revolves around the ramen and the individual ramen houses. Anyone ever watch that movie The Ramen Girl with the late Brittany Murphy? Originally from China, the noodles (like the chinese Lai-mein, hand pulled noodles, which, is fun to watch and incredibly delicious to eat), are usually served in broth with various accompaniments. Ramen with satay beef is one of my preferred breakfast dishes when in Hong Kong. I think it is safe to say, Ramen (and the Chinese Lai-mein) is my comfort food. Ramen has always been part of my life. We use the Nissan brand (the one with the Chinese on the packaging). When my mom or I make it, we serve it in broth with a fried egg (over easy for me) and some chinese broccoli rabe. A splash of Maggi Seasoning and Sriracha Sauce, and it was good night. Occasionally, if I am feeling salty, a thin slab of pan fried Spam too. Yolk covered noodles make me happy. It is the meal of champions in my book. 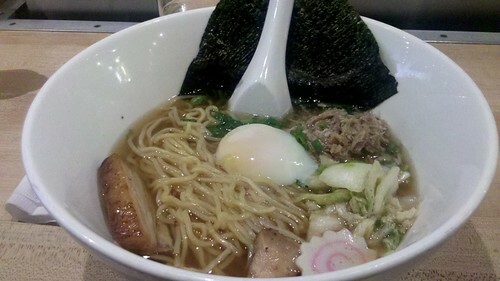 Everyone has their own opinion as to what makes good ramen. For me, it all comes down to the noodles. The noodles need to be firm and have a spring to them when you bit into them. They need to be long so as I take multiple bites, I won’t be left with spoonfuls of noodle bits at the bottom of my broth. Fresh noodles are the best, instant is good enough at home. What is your comfort food? What makes you feel better after a crummy day? 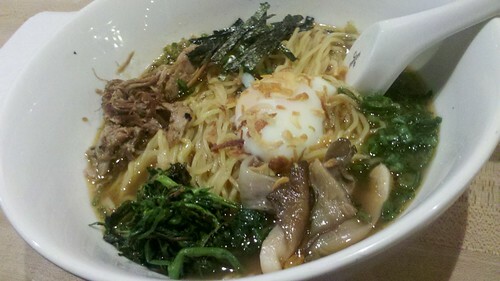 And yes…Momofuku was better than Ippudo…hands down. This entry was posted in Uncategorized and tagged Lunch, Ramen. Bookmark the permalink. OMG, I passed by on New Year’s eve–just missed you by a day! Still a dream of mine to go–I’ve been reading David Chang’s (owner of Momofuku) new food magazine Lucky Peach and totally love it! Glad the food was as good as the hype!